This post was written as a guest entry for a reader’s words, the blog of the perceptive and literary-inclined Bhupinder Singh. Writers are often cited as perceptive observers of the prevailing human condition. Some of the greatest writers have used the power of their written word to bring across the struggles and sufferings of the exploited before a wider audience. There exists a small section of writers, however, which feels compelled to act as more than mere spectators and reporters of the human condition. They throw themselves into the fight, as it were, of deprived people. This trailblazer of a writer is arguably the finest example of activist writers in India. For more than a quarter of a century now, she has been actively working with tribals in certain Indian states. She fights for their basic rights, helps them unite and become self-reliant, and writes about their life, often reduced to a sub-human level by the rich and powerful. A prolific writer, most of her recent work draws from her association with these marginalized communities. Mahasweta was born in undivided India in 1926, about two decades before India’s independence. The daughter of Manish Ghatak, a poet and novelist, and Dharitri Devi, a writer and social worker, Mahasweta probably had literary activism in her genes. It was community service that emerged on the scene before writing, though. 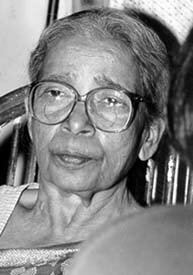 As a college student, Mahasweta joined her friends for providing relief to the victims of the infamous man-made Bengal famine (1942-44). They would distribute food, check through dead bodies lying in street to reach out to those still alive, feed them and take them to relief centres. 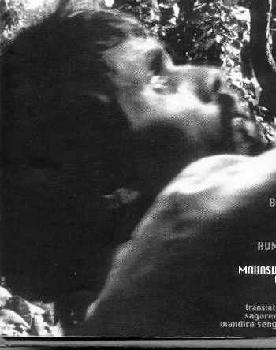 This direct, raw brush with suffering became the seed of Mahasweta’s empathizing disposition. Marriage came early, at the age of 20, when she tied the knot with Bijon Bhattacharya, a renowned Bengali playwright. Her husband was also a member of the Communist Party of India (CPI), and at the time the couple was establishing its marital life, communists often became the targets of persecution. As a result, it became tough for Bhattacharya to support his family, extended with the birth of their son, Nabarun, two years after their marriage. Mahasweta did several odd jobs to keep the hearth burning—selling dye powder, supplying monkeys for research to the U.S., teaching at a school, private tuitions—before she finally got a government job at the Post and Telegraph department. But this job was not to last for too long either. Someone dropped a few books of Marx, Lenin, and Engels in her office drawer, and Mahasweta was terminated on the charge of being a communist. This is when she took to the pen—mainly to supplement family income. She started with light fiction for literary magazines. Her first book-length work appeared in 1956. Jhansir Rani or The Queen of Jhansi was a fictional account of the life of Lakshmi Bai, an Indian woman ruler who valiantly led her forces to fight the British, before being killed by them at age 22. Even as a first-time author, Mahasweta showed the impractical sincerity that distinguishes true writers of historical fiction. She borrowed money from family and friends to travel to the Bundelkhand region in north India, where Lakshmi Bai ruled, and walked her way through remote villages and deserts, collecting oral history, folklores, and ballads. Interestingly, this same seriousness of approach in collecting data for her stories would be seen years later, during the activist phase of her life. The debut book brought Mahasweta recognition as a writer, and thus started her ascent in the world of Bengali literature. She authored several books, adding the pennies toward sustaining her family, while at the same time mirroring the prevailing social atmosphere. This promising writer went through a period of personal turmoil, during which time her marriage broke apart, and she suffered from acute depression. Bouncing back soon, she completed her master’s degree in English and served as a lecturer of English literature for two decades. This was also the period when she came up with her seminal novel, Hajar Churashir Ma (The Mother of 1084), which deals with the Naxalite movement in West Bengal that saw many young lives ending before their prime. The book captures the sad realities of the movement through the eyes of the mother of one such young boy. In her attempt to understand the violent movement, this mother comes face to face with her sense of estrangement from the double standard-ridden bourgeois society to which she belongs. Poignant, yet shorn of overt sentimental elements, the novel made a big impact on readers across India and was recently taken to the silver screen by director Govind Nihlani. Over the next few years, Mahasweta’s pen took a decisive turn. She started integrating history into her storytelling. This wasn’t the conventionally disseminated history though; this was forgotten history, a part of the past that had been conveniently kept under the wraps. She wielded the power of narrative to document as well as spread stories of tribal resistances against the British and other social exploitations in books such as Aranyer Adhikar (Right to the Forest), and Chotti Munda O Tar Teer (Chotti Munda and his Arrow), among others. Here was a writer who truly wrote what she knew. Her vocation wasn’t divorced from her writing. She is amongst the foremost activists working for a better life for India’s tribals. Not content to stay cosy within her writing room, she ventured deep into the forests to live and work with tribal people. She founded India’s first bonded-labour organization in 1980, bringing together thousands of bonded labourers to give them an organised platform for raising their voice against forced labour. A year before this, she turned Bortika, a literary periodical edited by her, into an open forum in which tribal people, peasants, factory workers, and rickshaw pullers wrote about their day-to-day experiences and problems. This effort of hers is groundbreaking, since it records the issues of the underprivileged in their own words, unadulterated and unadorned. She went on to create a tribal welfare society for the Kheria and Shabar tribes, which are among the poorest in India. In 1986, this untiring champion of the voiceless founded the Adim Jaati Aikya Parishad or Ancient Tribes Union, a forum of 38 West Bengal tribal groups. Yet, another wonderful post, Sury. The attention and care you put into every delivery never ceases to amaze me. Congratualtions! Thank you, Cesar 🙂Anonymous, welcome to my blog. Glad the post helped you. Good luck for the exams! Looking at the bones of her face in that photo makes me think she must have been a beautiful woman – which surely must have complicated her struggle and her cause. A remarkable woman. Thanks for sharing this, Bhaswati. A very good post Bhaswati. I had never heard of her before until reading this blog and I’m definitely going to learn more about her. A very informative blog. It’s a shame though that she had to have an award giving to her called the “Ramon Magsaysay” award since President Magsaysay of the Philippines (during the 1950s) was a puppet for the United States of America and enacted policies that plunged even more of his fellow Pilipinos into poverty and tried to eradicate the Communist Party of the Philippines (PKP, Partido Komunista ng Pilipinas). You can learn a good deal about Magsaysay in the book “Philippine Society and Revolution” but its hard to find, you can find it on the website for the League of Filipino Students though. But nonetheless, what a great activist, if only I could contribute a tenth of what she did to society I would have lived a good life. Thanks for the comment, Jack. Good you read it, because I didn’t know any of that about Magsaysay. How ironical could that be? I will look into the link you mentioned. Thanks for thatComing to Mahasweta, she does put one to shame, doesn’t she? 80 years old and still fighting the battle for her unsung heroes in forests and remote villages of India. Incredible.